Hero Histories: "...into the Third Dimension leaps...Captain 3-D!" "...into the Third Dimension leaps...Captain 3-D!" In the early 1950s, "3-D" using red and green prints of simultaneously-shot movie footage from cameras a couple of feet apart. 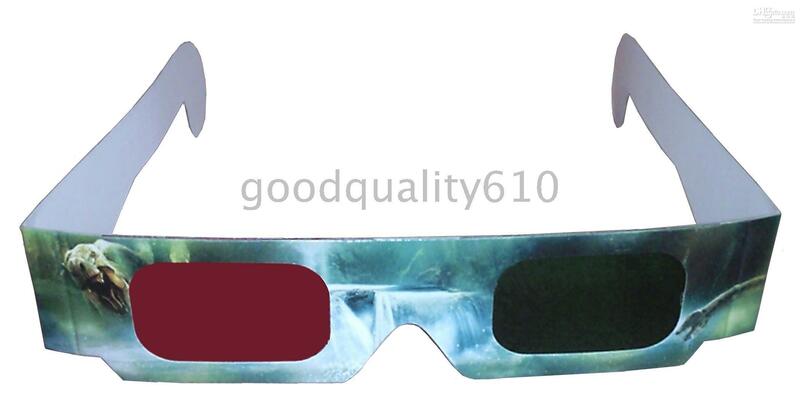 (note: sometimes blue was used instead of green, but the stereotype of 3-D is a red / green lens juxtposition.) became the hot format in movies. 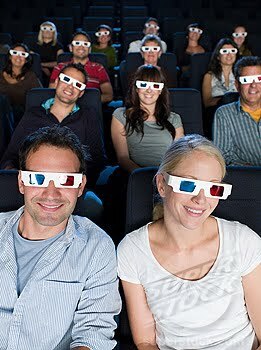 When a viewer wore glasses like these they would perceive the two projected images as a single 3-D image! Taking comic book line art and modifying it to produce a similar 3-D effect was technically simple, so almost every company attempted at least one 3-D book between 1952-55. Most were 3-D versions of existing comics including Superman, Batman, Tales from the Crypt, Tor, even Katy Keene! 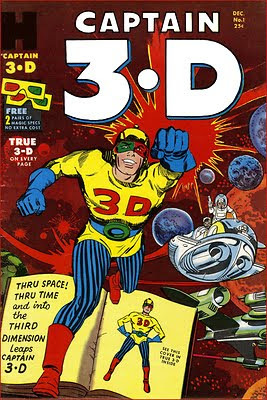 However, Captain 3-D was the Simon & Kirby team's attempt to jump on the 3-D bandwagon with NEW material. A disheveled, stranger stumbles into a seedy used bookstore. He hands a book and pair of weird glasses to the young clerk, warns him to never sell it, just as a gunman comes in and shoots the stranger, disintegrating him. The clerk, Danny Davis, disarms the gunman, who flees and is shot by an associate waiting outside. Danny puts on the glasses and looks thru the book, which is blank except for an illustration of a costumed man which jumps from the page and stands in front of Danny. Before another word is said, the associate gunman returns...with allies! The costumed man defeats the group with ease and tells Danny to look at them thru the strange glasses. Danny sees the attackers as cat-people! As it turns out, the costumed man is the last survivor of an advanced civilization wiped out in a war against the Cat People 50,000 years earlier. Placed in the book by advanced technology, he is brought to life by the holder of the book and glasses to battle the Cat People, who were all but wiped out, but who now have sufficient numbers to try to conquer the world again! Unfortunately, a legal battle involving the 3-D process all but killed the financial viability of producing 3-D comic books, and, though material was already finished, there was never a second issue of Captain 3-D! We at Atomic Kommie Comics™ feel the character deserves better than that, so we restored him (or at least his cover) to our all-new 3-D Comics & Movies line (in the Comics section, naturally)! Wow, thanks for that link to Comic Book Urban Legends Revealed and the story of how William Gaines destroyed 3-D comics! It's not as exaggerated as you might think!